UPDATE: DUCKLING FLIGHT! During the afternoon feeding, one of the ducklings, sitting on the duck island and seeing everybody get their noms on the other side of the pond, simply took off effortlessly and flew to the other end of the pond. The first flight I’ve seen! Now that I know they can fly, I also know that they’re staying on to freeload. But it was still exciting! 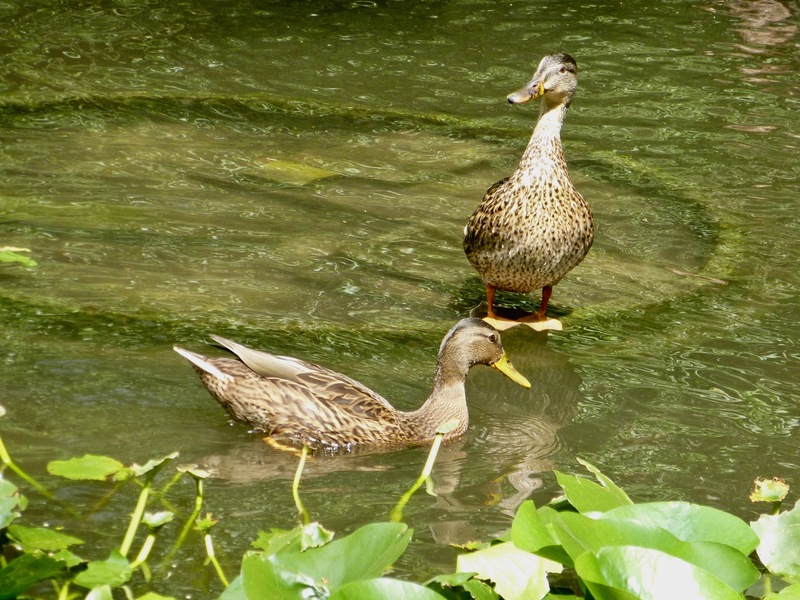 Well, all is pretty good in Botany Pond, but as the ducklings come closer to fledging (it should be about now), the internecine strife continues. 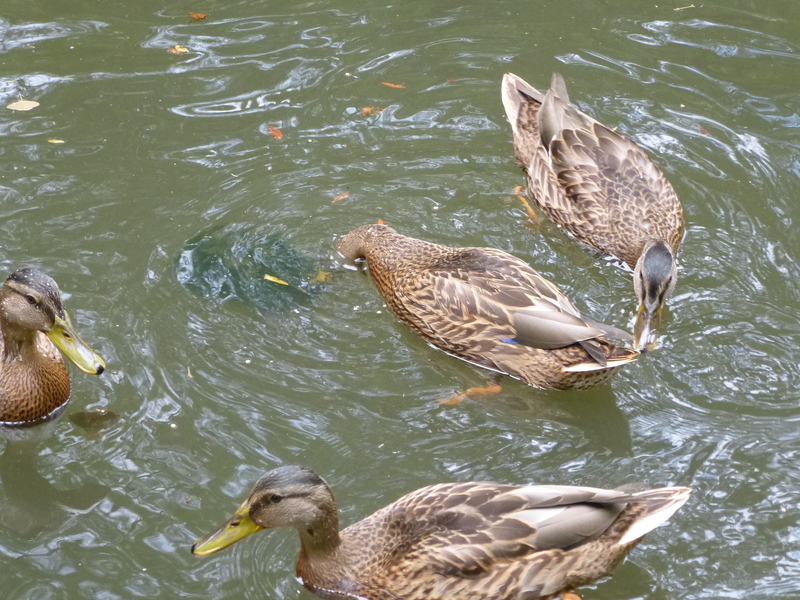 There are duck fights; and one smallish female, whom I call Phoebe, is picked on by the others to the extent that she swims and rests largely alone, and quacks piteously when separated from the others. I make sure she gets lots of food, but those quacks (which proves she’s a female, since males don’t quack) break my heart. Honey herself, in fact, pecked at Phoebe yesterday, taking out a feather or two. Honey is still off her feed, eating only corn and mealworms (this, I’m assured by experts, is normal for molting females), and looks at me longingly after I’ve already given her the ration of food. I’m sort of wishing that the young ‘uns would leave, if for no other reason than so poor Phoebe can finally get some rest, and so Honey can be relieved of her mothering duties, which continue, and I can feed her up with treats. I adore this sedulous duck. Look how big her offspring are, and their flight feathers are fully grown. They can fly, I’m sure, but I haven’t seen it yet. Honey is cutest when she looks right at you. Feeding time yesterday morning. 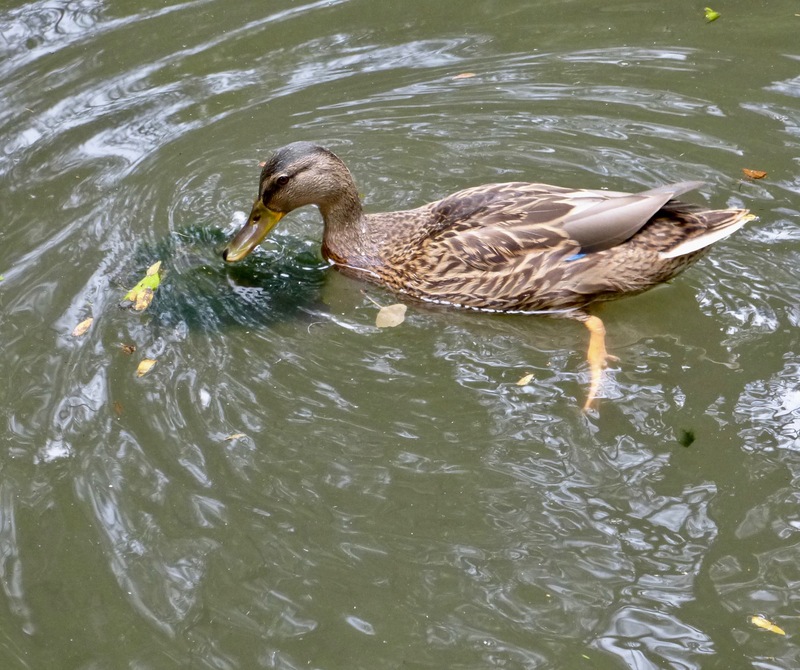 Phoebe was missing: she enters with the other ducks, but as soon as the food is in the water, they drive her away. I have to run around the pond like a crazy person to ensure that she gets fed. Can you pick out Honey? Something new that I found vastly amusing: when I was feeding them yesterday afternoon, an algae-covered turtle swam by. One of the brood proceeded to follow the turtle, pecking at it and eating the algae off its back! 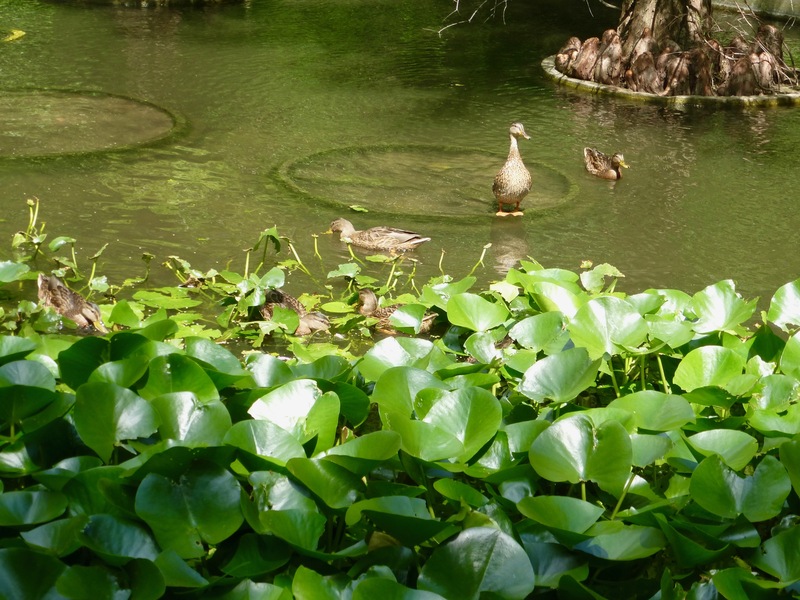 This is a mutualism, for I’m sure the turtle doesn’t like to be covered with algae (it may camouflage it, but there are no predators here and the growth slows down swimming), and the duck gets a snack. Also, the turtles eat the leftover duck food, so nothing is wasted. It’s a harmonic two-species ecosystem (three if you include The Feeder). The turtle grazer follows the reptile down as it dives. This entry was written by whyevolutionistrue and posted on July 28, 2018 at 3:00 pm and filed under ducklings, ducks. Bookmark the permalink. Follow any comments here with the RSS feed for this post. Both comments and trackbacks are currently closed. Interesting to imagine what goes through a ducks “mind”, (if you believe in that sort of thing), on the first flight. Can you imagine one day discovering that you can totally fly? I would be like dang this is cool. There is a lot of fledging activity going on near where I live in the suburbs of Chicago. Some back story. The city has a combined sanitary and storm sewer which creates numerous problems. Chicago reversed the flow of the Chicago River back 1900 to keep sewage out of Lake Michigan. And it has been fighting that battle ever since. The Deep Tunnel project may have finally solved it. The suburbs have gone to separate sanitary and storm sewers. That requires a lot of retention and detention ponds for rainwater. Which has given us a lot of wildlife. 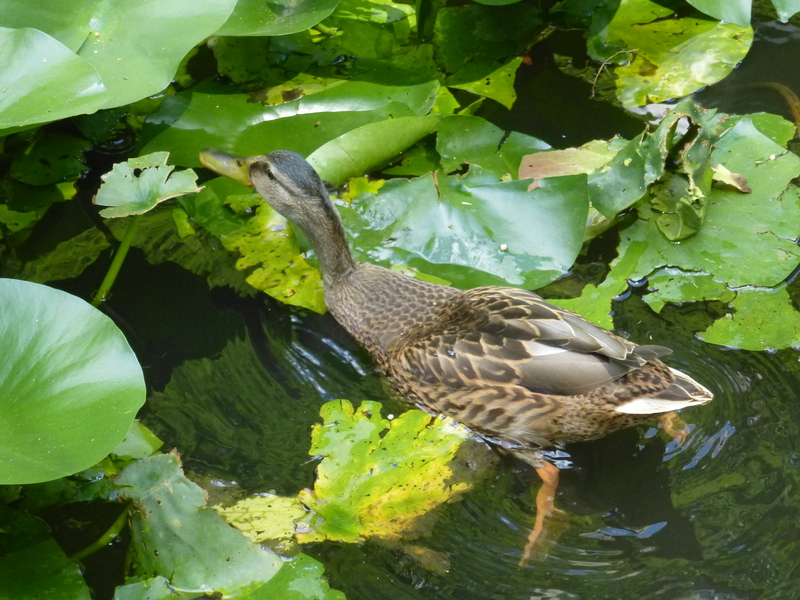 You cannot get as close to the birds as you can in Botany Pond. So it is hard to monitor the progress. 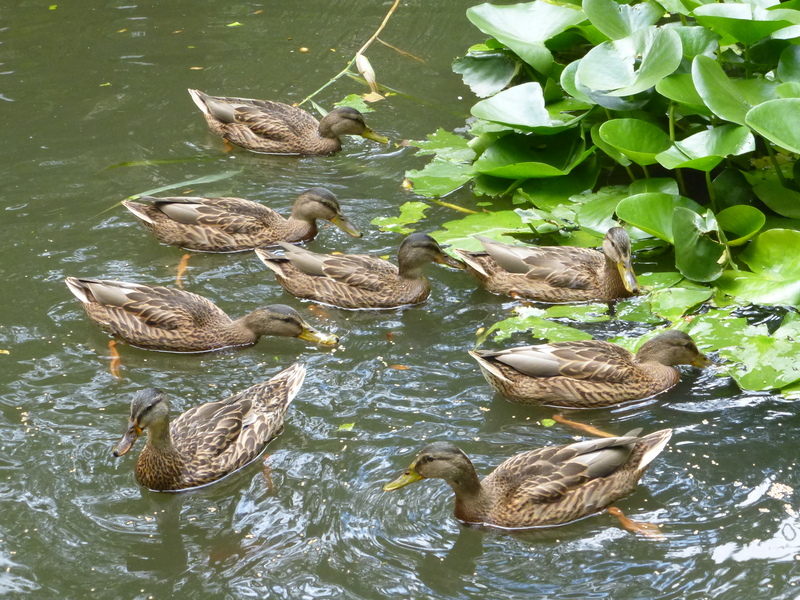 But in the past few weeks, there are groups of ducks at a couple of ponds near me. And they are beginning to fledge. Many of the young (I think they are young) are flying large distances in the ponds. I am thinking of breaking out my old film camera and my 300mm lens and taking some pictures. Can you still get film developed these days? I had a point and shoot with 12x optical zoom but it broke. And my phone does not cut it. I do plan on getting a new point and shoot camera. Any recommendations. I use one of the Panasonix Lumix Z series cameras. They have Leitz lenses, can zoom up to 20X, and are pretty inexpensive. Check them out on the internet: there are several models. Don’t spend a lot of money, the technology changes so fast that an expensive, top of the line camera will still be obsolete in a couple of years. Thanks. Now I have to figure out what all the different features are, which I actually need and what I just want. Am going to Tuscany in March so I want a new camera by then. So what possible adaptive advantage is there in pestering a sibling when you’re both about to fledge anyway? Phoebe shares a lot of genes with her harassers presumably, so you’d think her success would benefit the genes present throughout the whole brood. Maybe a month ago there might have been some slight advantage in suppressing her feeding, etc., but why now? You got me. She’s still less related to a harasser than a harasser is to itself! But the same would be true of Honey and any of the ducklings. Yet Honey is still protecting her relatives/offspring. 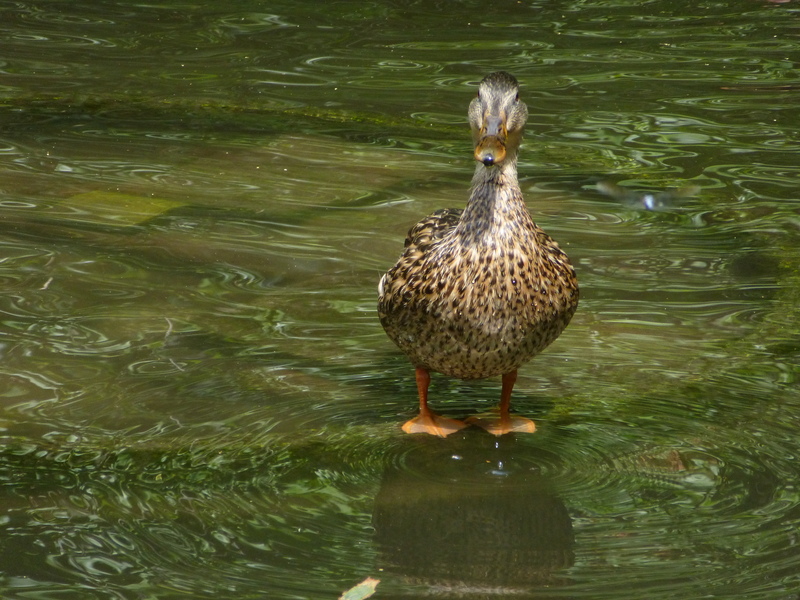 I think ducks may not always understand where their Darwinian advantage lies. Hypothesis: Harassing a vehicle of ones genes encourages it to depart the pond sooner – more food for those that linger & the one that moves on helps ensure the genes are not all in one small pond. Another hypothesis–the rest of the brood senses some weakness in Phoebe and thus “wants” to rid the flock of a potential hindrance. Animals that flock or form herds are notorious for picking on the weak (like similar animals who form cities & governments…). Cone on, folks, admit it. Which of us didn’t harass our brothers or sisters when we were kids, especially over who got the biggest piece of pie. I know I did. Why would ducks be any different? The pecking order is the only “purposeful” thing here; it serves to maintain order in a community. Nature does not care what happens to those on the bottom as long as the species is served. “Phoebe” — after the grandmother of Apollo? When do the male heads turn green? Next year sometime? Those were ducklings I saw near where I am. They weren’t ducks I saw on here. My guess is the heads would start to turn green soon. I visit this website every day, but rarely comment (I have no scientific qualification), but I find your writing wonderfully affectionate. I hope all of the ducklings fledge successfully. Borne on good wishes. I hereby dub that duck Gustave Whitehead. Honey looks as if she has binocular vision! As a side note, my city of Sofia has been built not at one large river, as most cities are, but at several small ones. I grew up next to one of them, and it has always been little more than sewage. 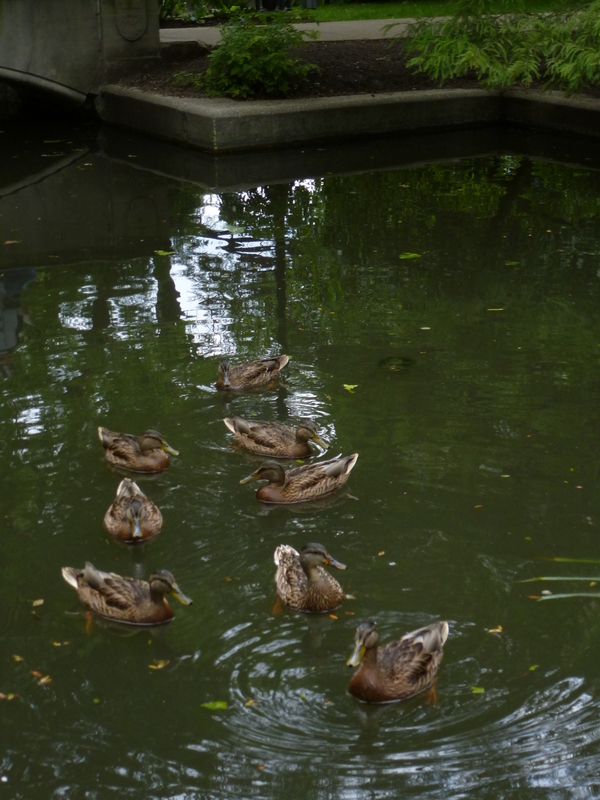 Today, I crossed it and saw for first time a bunch of ducks at the bank!